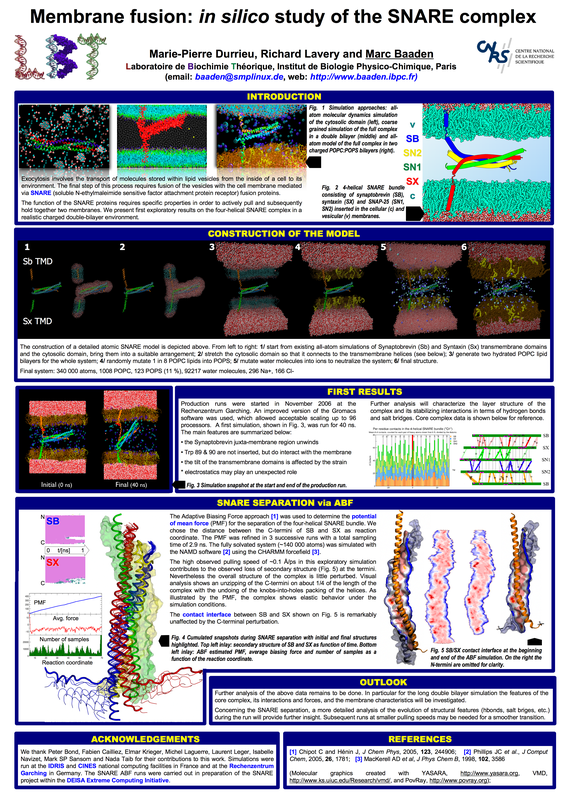 SNARE/DECI: SNARE mediated membrane fusion, DEISA Extreme Computing Initiative. Bond, Krieger, Durrieu, Taib, Leger, Laguerre, Lavery, Sansom & Baaden 2006, 2007. 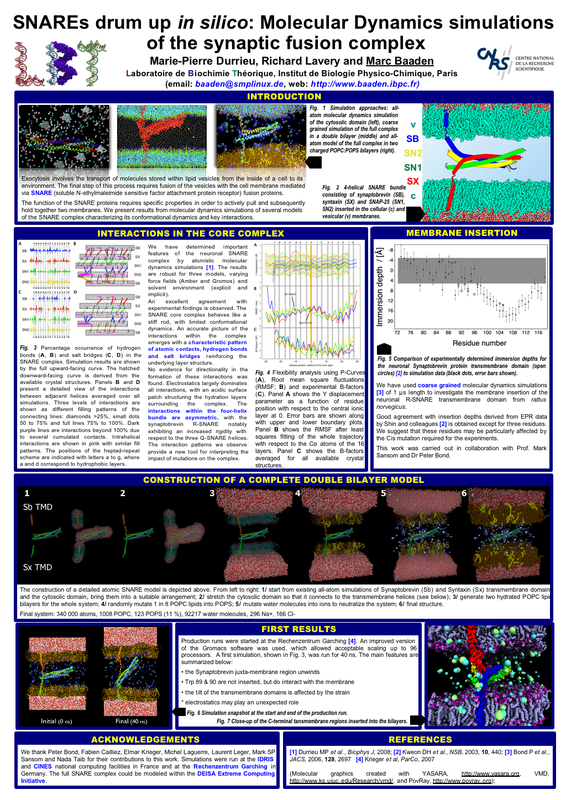 New and exciting results on the SNARE double membrane system. Writing up. Stay tuned! Our paper "Coarse-grain simulations of the R-SNARE fusion protein in its membrane environment detect long-lived conformational sub-states" is published in ChemPhysChem. M.P. Durrieu, P.J. Bond, M.S.P. Sansom, R. Lavery and M. Baaden: "Coarse-grain simulations of the R-SNARE fusion protein in its membrane environment detect long-lived conformational sub-states", ChemPhysChem, 10, 2009, 1548-1552. E. Krieger, L. Leger, M.P. Durrieu, N. Taib, P. Bond, M. Laguerre, R. Lavery, M.S.P. Sansom and M. Baaden: "Atomistic modeling of the membrane-embedded synaptic fusion complex: a grand challenge project on the DEISA HPC infrastructure", 2007, in ParCo 2007, Parallel Computing: Architectures, Algorithms and Applications, edited by C.B.G.R. Joubert, F. Peters, T. Lippert, M. Buecker, B. Gibbon, and B. Mohr, Vol. 38, pp. 729-736, John von Neumann Institute for Computing, Juelich, Germany. M.P. Durrieu, R. Lavery and M. Baaden: "Interactions between neuronal fusion proteins explored by molecular dynamics", Biophys.J.94, 2008, 3436-3446. N. Férey, O. Delalande, G. Grasseau and M. Baaden : "From Interactive to Immersive Molecular Dynamics", 2008, in Proceedings of the International Workshop on Virtual Reality and Physical Simulation (VRIPHYS'08), edited by F. Faure and M. Teschner, pp. 89-96, Eurographics, Grenoble, France. You can also access my complete list of publications with links to the download locations. DEISA Newsletter, Vol. 5, 2007: We presented the SNARE use case at the 4th DEISA training session at the Finnish IT center for science CSC. 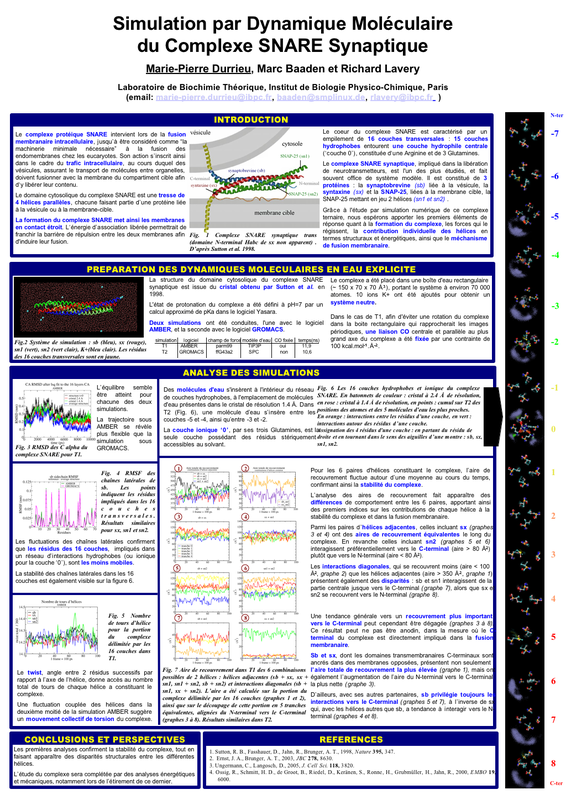 SNARE: : Membrane Fusion project of the DEISA Extreme Computing Initiative 2006. Multi CPU support in YASARA. 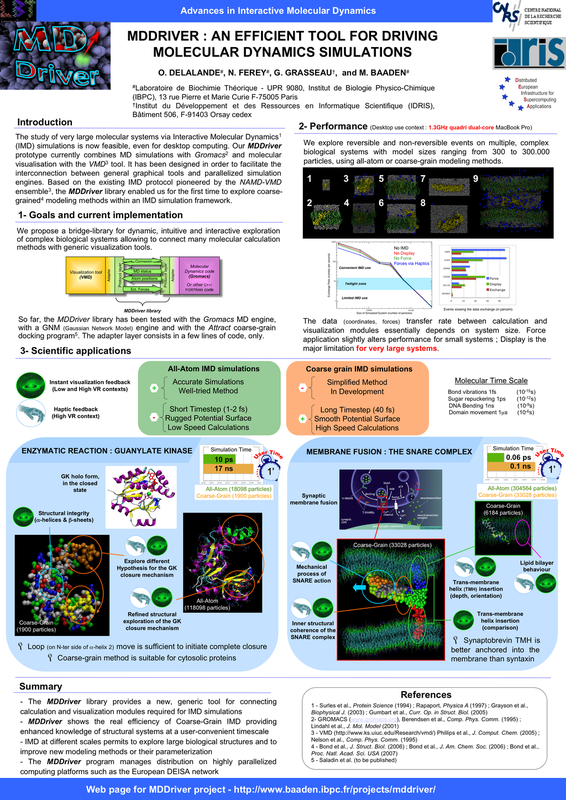 DEISA Extreme Computing Initiative LIFE SCIENCES leaflet. The SNARE/DECI logo is copyright 2007 by Marc Baaden. It is licensed under the creative commons license (see page footer for details).